﻿MARSHALL:	Major concern is establishing your name. HAMILTON:	My name is, my name is Vanzetti, Vanzetti M. Hamilton. MARSHALL:	Okay. What does the M stand for? MARSHALL:	Um, what was the date of your birth? MARSHALL:	August 19, 1927. Now. Give me your father’s name. MARSHALL:	And do you remember his birthday? He did live here. MARSHALL:	Probably already got it, but I’m just going to have to double-check. HAMILTON:	I have it in a, in a particular locale but I don’t have it with me. HAMILTON:	But it was in, it was September, I believe of 1894. Yeah, September of 1894. I’m not sure of the date right offhand. MARSHALL:	Okay. What about your mother? MARSHALL:	Yeah, her name. Her maiden name. HAMILTON:	Her name was Sarah Louise Beatty. MARSHALL:	Sarah Louise Beatty Hamilton. HAMILTON:	Mm-hmm. Uh! Excuse me, excuse me. Sarah Louise Beatty Shuford. She always liked to use that. HAMILTON:	That was her maiden name. HAMILTON:	Shuford was her maiden name. HAMILTON:	[Mike] Beatty was her mother’s name. HAMILTON:	She always thought about that, because there weren’t too many Shufords around, but there were a lot of Beattys. MARSHALL:	I never heard of anybody I guess named Shuford. Shuford is a new one. HAMILTON:	No, no, there weren’t, there weren't too many Shufords. HAMILTON:	They were, they were out of North Carolina. MARSHALL:	Now where’s your father? HAMILTON:	Arkansas. Little Rock, Arkansas, in that area. HAMILTON:	still around there, mm-hmm, mm-hmm. MARSHALL:	Some of mine are still around there. That’s my mother’s side. Maternal side. HAMILTON:	His father was a teacher. MARSHALL:	What, what’d your father do? HAMILTON:	He was, well, he was a laborer really. HAMILTON:	problems, and he was in college in fact. And, uh, had to drop out of college to go to war, and never got back. MARSHALL:	When did he move to Ypsilanti? HAMILTON:	We were all born, mm-hmm. MARSHALL:	All of you were already born. HAMILTON:	We were all born in Detroit, mm-hmm. MARSHALL:	Give me a run, rundown on your siblings. MARSHALL:	Next one to you. HAMILTON:	Well, I better start with the oldest and come back. MARSHALL:	Oh, oh, that’s right, that’s right, you’re not the oldest. HAMILTON:	Would be better. I’m the middle one. MARSHALL:	When’s his birthday? The—Theo? HAMILTON:	Theo’s birthday is February, February the 6th, I think Theo was born in about nineteen…about 1921. Mm-hmm. MARSHALL:	Well, one of the things about—I am interviewing Theo. MARSHALL:	So, we’ll get that. HAMILTON:	Not quite sure offhand, we’ve got it written down, I [don’t have casing] though. HAMILTON:	Next one was my sister Theressa, T-H-E-R-E-S-S-A. A, middle initial E, Hamilton. MARSHALL:	The one that lives in…Flint. HAMILTON:	Flint, mm-hmm. And she’s the next in age to him. She probably 4:00wouldn’t want me to give her birthdate. If he was born in ’21 or ’22, then you know when she was born. MARSHALL:	Yeah, sort of figured out. Some of these they already have down there, but I’m trying to—you know, they have a file down there of everybody who ever lived in Ypsilanti. MARSHALL:	And they give all this information. MARSHALL:	especially when they’re black. MARSHALL:	so, what you don’t remember, don’t worry about it. Okay, who followed her? HAMILTON:	The next, the next child is Dalphon, D-A-L-P-H-O-N, Dalphon A. Hamilton. MARSHALL:	What does the A stand for? HAMILTON:	He’s named, he got the A from my, my grandfather. HAMILTON:	My father’s father, who was named, middle name was Thomas Augustus. And he was named, he got his middle name. MARSHALL:	Uh-huh. Where’s he live now? HAMILTON:	He lives in Chicago. HAMILTON:	And I’m the next one. Then after me is Phanuel, P-H-A-N-U-E-L, Phanuel J. Hamilton. HAMILTON:	He lives in Chicago, too. HAMILTON:	And then after him is Aquilla, A-Q-U-I-L-L-A, Aquilla Hamilton. And then the youngest one is Donald Uziel U-Z-I-E-L, Hamilton. HAMILTON:	One girl and six boys, mm-hmm. MARSHALL:	Now they moved here, your family moved here, around 1936. HAMILTON:	All of us grew up here. MARSHALL:	even, even, uh, uh, the 1921. MARSHALL:	about fifteen years old. HAMILTON:	Well, he was in junior high school. HAMILTON:	Yes, mm-hmm. He and my sister. HAMILTON:	Mm-hmm. He was in junior high school. MARSHALL:	Okay, now, you came here and, and, ’36, and, ’course, um, do you remember anything specific about the area when you came? MARSHALL:	so far as, um, it being black in Ypsilanti was concerned? HAMILTON:	Yes…we can only live, or by, south of Michigan Avenue. MARSHALL:	Wasn’t a real estate person. HAMILTON:	Oh no, no, no. It was a citizen. A citizen. MARSHALL:	I was just thinking, you didn’t have any real es—black real estate people then, did you? MARSHALL:	Yeah. You did have some later on. HAMILTON:	Yes. But I, as I recall, we—when we bought, we—there weren't any. HAMILTON:	they should go see, like, uh, Pete Brooks. HAMILTON:	And, as I got older in high school, Herbert Francois. HAMILTON:	with the purchase of property. And um, uh, but we were, we all lived, 8:00we had to—we didn’t have to, but I’m sure we did, because uh, we, we, the only place we could buy, we, we bought a nice piece of property that was prime land in that day. HAMILTON:	rough roads. And, uh, but the land, but it was a beautiful rural area, semi-rural area in south Ypsilanti. MARSHALL:	I have heard from other sources that the Hamilton children, uh, uh, were quite, quite influential in the schools, in the schools, as they went through. The [thought and we feel] who was music—who was musically inclined. That he sort of paved the way, because first of all he was smart, and secondly he had this ability, and that in some cases he was a first, in some of the participations that he, in which he, well, some of the things in which he participated, and that the other boys in their way sort of, sort of like your 9:00boys have been. HAMILTON:	He did, he did. HAMILTON:	Already paved, they’re just gonna expand on it. HAMILTON:	’Cause it was little, many of the kids at his age, they were 10:00dropping out of the school in the eighth grade. They were leaving school like flies [laughs] and, uh, fact, he ju—he just got through high school when the war started. HAMILTON:	Well, the war had started, he just got through high school. HAMILTON:	And went right in the service. HAMILTON:	Mm-hmm. He and my sister went. And then right, and the third boy, second, second boy, Dalphon, he went. MARSHALL:	Mm. But your—you didn’t go. HAMILTON:	No, it was, uh, I, uh, my third, my third brother, the one younger than me, volunteered. HAMILTON:	But, uh, I, uh, I had just, I finished high school, just, uh, just before VJ Day. MARSHALL:	You were pretty young. HAMILTON:	oh yes, but I was, I was, I was not 18. MARSHALL:	How’d you miss, how’d you miss the Korean War? HAMILTON:	Uh, nn, I don’t know, other than that the, they just didn’t call me. HAMILTON:	And I was teaching school. MARSHALL:	That came around ’48, ’49. HAMILTON:	Yeah. I was teaching school. HAMILTON:	No, I’m sorry, I was just finishing up school. HAMILTON:	Finishing up college at Eastern. HAMILTON:	Mm-hmm, I just finished, mm-hmm. MARSHALL:	Now, you uh, uh, uh, let me see, you said there’s six boys and one girl. MARSHALL:	Now, all of them went to college at some place, right? HAMILTON:	All of them started. MARSHALL:	At least started, okay. HAMILTON:	Yes, mm-hmm. They all started at Eastern. MARSHALL:	Uh-huh. But all of them didn’t finish. MARSHALL:	In other words. Now, you are the lawyer. MARSHALL:	Theo is the educator, so to speak. HAMILTON:	Musician—he’s given it up pretty much now. MARSHALL:	Now. Your sister is a counselor. HAMILTON:	Well, no, she’s an educator. She’s really an educator. MARSHALL:	Educator. Okay. That’s in Flint. HAMILTON:	Yeah. She’s just, she's the principal. MARSHALL:	Oh, she the principal? HAMILTON:	uh, she’s a principal. MARSHALL:	Now, you got these two brothers in Chicago. MARSHALL:	What are their names? HAMILTON:	what it was. He left Eastern and went into the service. HAMILTON:	And uh, went to officer’s candidate school. HAMILTON:	got a, got a, uh, and he was discharged as a captain. HAMILTON:	Mm-hmm. But my sister also went into the military. MARSHALL:	Yeah. She was, she was an officer. HAMILTON:	into the general ranks? HAMILTON:	Is that what it is? MARSHALL:	Mm. I knew she was that, ’cause I’ve met her. HAMILTON:	She finished Eastern. And uh, she’s about, she has her, she’s gone on and got her Ph.D. now. HAMILTON:	And, uh, now, the next kid, next son, below her, he didn’t go to college. MARSHALL:	I know by that time, there was a cure. HAMILTON:	Oh yeah, they cured it, in fact they closed down the, he was up at Howell, my dad every Sunday for three years he’d go up there to see him. Took us all of course, y’know. Every Sunday. Boy! But that’s how loyal he was to his kids. MARSHALL:	I have several relatives who died. MARSHALL:	In fact, my father had four brothers, and they all died of consumption. MARSHALL:	Um, all, all except my father, my father died of something else. Uh, but they all, none of them lived beyond ’33. MARSHALL:	My father died in ’33. MARSHALL:	So I know what you’re talking about. HAMILTON:	That was, that was, that was pretty rampant in this community. MARSHALL:	It can be c—I mean, it’s a, it’s a disease you can catch. MARSHALL:	they can knock it out. HAMILTON:	oh, they can take care of that. MARSHALL:	In those days, you couldn’t. HAMILTON:	they really can take care of it now. Moment’s notice. MARSHALL:	I know what you mean. MARSHALL:	Uh, then, um, how’d you get to, well, you, you, well, let, let me [and for] go ahead and establish some basics, again. You graduated from Eastern 15:00what year? HAMILTON:	because I just turned 18. HAMILTON:	I’m sorry, I’m sorry. I turned, I had just, well I had just finished and they were still talking about drafting people. HAMILTON:	because I had just turned seven, just turned eighteen shortly before V-J Day. HAMILTON:	But they did let me finish, um, um, Eastern, they never, they never drafted me. HAMILTON:	And, um, so when I finished Eastern, I, I wasn’t even old enough to teach. HAMILTON:	In fact, I wasn’t old enough to vote. 21 in those days. HAMILTON:	came around, so I could sign the contract. I always wondered about that. HAMILTON:	cars, before the other companies got going again. HAMILTON:	there, back in ’48, ’49, and ’50, and then, ’52, he started going down, because the other’s car—other companies started moving along. MARSHALL:	Yeah, I’m sure, I’m sure that was interesting. MARSHALL:	We had some ones I had, well, my wife had some interesting 17:00experiences with the union, but I would get John on that. MARSHALL:	How many, how long did you work before you decided to cut out and go to law school? HAMILTON:	I got my master’s in ’52. MARSHALL:	You got a master’s in education. HAMILTON:	and the, and the worker, and then, and the, and this, the committeeman [lynn goat] in the, in the morning sit in on the conferences where they were negotiating for a new contract. HAMILTON:	John was very instrumental in that. HAMILTON:	And, uh, but, again, so I finished that up in ’52. HAMILTON:	and so I thought I’d better get to work. MARSHALL:	Was law always kind of in the back of your mind? HAMILTON:	in this area, and so, uh, so I went to, I, I in ’54 decided I would, I applied and took the exam, and I apparently did okay on the exam, but they weren’t letting too many blacks in school at that time, in fact, of a, of the, of a entry class, freshman class at Michigan in that year, of ’54, 1,500, there were two blacks. HAMILTON:	Oh, you know Bill Alexander? MARSHALL:	Oh, I met him, yeah, yeah. HAMILTON:	but I, somehow through the good faith of the Lord I’m sure, and, and, uh, I’m sure, I’m sure that was it, I always say it was, because I don’t see how it could be possible, I immediately, immediately, I was so disgusted I went and applied to Wayne State, and I’ll be doggoned if they didn’t take me in. HAMILTON:	They took me right away! HAMILTON:	couldn’t get in law school anywhere in Florida. MARSHALL:	[And] came up here. HAMILTON:	Came to Michigan, got in to Wayne State. MARSHALL:	Now, they were, I know they were [rougher in those] states. MARSHALL:	[Laughs] I know what you mean. I know what you mean. MARSHALL:	Okay, uh, somewhere along here you met your wife. HAMILTON:	Yes, I, I had met her when I was going to Eastern. HAMILTON:	She was going to Cleary. And so, uh, she, uh, we were dating, uh, frequently, and so she uh, the year I graduated, from Eastern, she had a choice of either staying here and working, either in the Ypsi Housing office, or the Willow Run housing office, or in Eastern housing office, they, as you can imagine in those days, they, they just didn’t hire the black girls were all, they were good, but they just wouldn’t hire them in other places. The federal 22:00government was a primary employer. HAMILTON:	And uh, so, she, she said she, she, I wasn’t about, I wasn’t ready to get married. HAMILTON:	She was working when I graduated. HAMILTON:	And, she wanted to settle down here, and I wasn’t really ready to settle down so that’s when she thought, “Well, I’ll go on back to Battle Creek,” because she just didn’t like the idea of living away from home. So uh, she went back to Battle Creek, to work, work in the VA office, and then we eventually kept in touch with each other and then we got married in ’52. Mm-hmm, mm-hmm. MARSHALL:	And then you had four children. HAMILTON:	Four children, mm-hmm, mm-hmm. MARSHALL:	Now, run down, run those down. HAMILTON:	Well, the oldest one is Mark. HAMILTON:	And he has the, he has my mother’s maiden name. MARSHALL:	What’s his [ ] birthday? HAMILTON:	Well, Mark was born in, Mark was born in ’54. HAMILTON:	Mm-hmm. Mark was born in ’54. In February of ’54. HAMILTON:	Just about when I started to law school, well, I was in the middle of my first year of law school. HAMILTON:	In, uh, February of ’54, and, uh, [what uh] he has my, he has my mother’s maiden name as his middle name, Shuford. MARSHALL:	Oh, I see, that’s what that S is for. MARSHALL:	And then the next child is Lawrence. HAMILTON:	who was born in ’57. HAMILTON:	And uh, he has my wife’s mother’s maiden name as his middle name. HAMILTON:	And, uh, in, just [coincidence] with Lawrence, we were very fond of Dr. Perry. HAMILTON:	So we named him somewhat in honor of Dr. Perry, Lawrence. HAMILTON:	And, uh, then the third child was a daughter. She was born in 1960. 24:00And we were very fond of a, a teacher who I had had, and we both knew him when we were younger, who was, um, [Gray Mellon’s] mother, her name was Laura. HAMILTON:	Laura. Her name was Laura Joiner. HAMILTON:	very good lady, and, um, we were just fond of her so we named Laura, someone in her honor and memory, a daughter. And then three years later came John. ’63. HAMILTON:	His name was John, because it’s John the last. HAMILTON:	[Laughs] So we named him John. And John has my, uh, my dad’s middle name, as John Elliott. MARSHALL:	Now your wife’s name was what before she got married? HAMILTON:	her name was Fullerton. Barbra J. Fullerton. MARSHALL:	What’s the J, Jane? HAMILTON:	And my daughter, daughter Laura, has her middle name, Jean. MARSHALL:	And of course, she’s from Grand Rapids. MARSHALL:	Battle Creek, Battle Creek, yeah. HAMILTON:	Her folks are, are from Arkansas and Mississippi. HAMILTON:	Her mother is from Arkansas, Mr. Fullerton, her father, is from Mississippi. MARSHALL:	Now, okay, uh, now, of course, I know about, I know that, uh, Mark went to uh, went to, uh, Morehouse. MARSHALL:	And Morehouse, [he made probably cap]. MARSHALL:	Okay. And then the second son, Lawrence. MARSHALL:	Fisk. Did he make Phi Beta Kappa? HAMILTON:	No, no, he made an honorary, for, an honorary society there but I’m 26:00not sure what it is offhand. MARSHALL:	Ummm…I think I know what it is. HAMILTON:	I know what it is, because they also have it at, uh, at Hamilton. MARSHALL:	It’s primarily on black schools. HAMILTON:	And Fisk—I often wonder why Fisk never had a Phi Beta Kappa chapter. It’s a [law school college]. MARSHALL:	Well, no school, no black schools had them until about fifteen, twenty years ago. MARSHALL:	Morehouse recently got [ ] I was reminded of that when I heard about your son. MARSHALL:	But no black school, up to fifteen years ago, had a Phi Beta Kappa chapter. No black school. MARSHALL:	So, uh, we were, we felt down [at the course] at Morehouse. MARSHALL:	Morehouse in black in, in the black educational circles. MARSHALL:	Howard University, I would say those three were the top institutions. I was at the other Lincoln. But the Lincoln that I went to was not nearly as high as the Lincoln in Pennsylvania. MARSHALL:	with those schools, or come out of Howard, or come out of [Fearson], or out of uh, out of, uh, Morehouse. And you could rank the, it was just known, 28:00that you could rank with anybody. HAMILTON:	I kind of thought that that was the way about Fisk, too. HAMILTON:	Mm-hmm. And Howard, of course. MARSHALL:	Pennsylvania, and Morehouse. I’d say those four. MARSHALL:	Those were the good schools. HAMILTON:	I can imagine, yeah. MARSHALL:	I think, I think Lincoln has been a good school. For example, a graduate of, of, of, a graduate of Lincoln Missouri, of my class, was an honor student at Lincoln, and he went on and got his doctor’s degree, and he’s the president of Central, in Ohio now. MARSHALL:	So I mean, he is one person who was way up there, and I think, would have succeeded anywhere he went. And this is true I think of all of them. But 29:00Lincoln never did have the reputation of the Lincoln, Pennsylvania. MARSHALL:	Morehouse, Morehouse, furnishes, furnished the presidents for Howard. MARSHALL:	a side issue but the, the point is that we were just so happy about, uh, Mark, and his, his going through that. And what Mark is now practicing law where he lives? MARSHALL:	And now Lawrence is pursuing graduate work. HAMILTON:	He’s finished, Lawrence, he got his master’s in public administration at the University of Alabama. HAMILTON:	So he was fortunate to get placed at, well, he applied and he was fortunate to get hired at, uh, Cincinnati. HAMILTON:	Where [Sy Murray] is. HAMILTON:	In fact, the personnel director at Cincinnati came from Ann Arbor too. HAMILTON:	His name is Garritt. Mr. Garritt. HAMILTON:	I don’t think he’ll go to law school. He might, he might go on the side. MARSHALL:	There’s so many people now who go into law who never really practice it. HAMILTON:	She a lawyer? Had a law degree? MARSHALL:	And then, President Ford, I mean President Carter [catched] her to Washington, and made her the commissioner of higher education. HAMILTON:	Not, not Patricia Ayres? HAMILTON:	She’s a part of it. MARSHALL:	She was second to the Commissioner. MARSHALL:	But she had the responsibility for higher education. MARSHALL:	for her own plans for progress in higher education. HAMILTON:	The Ku Klux Klan was coming. MARSHALL:	when I was a youngster, and the Ku Klux Klan come around, we shuddered. MARSHALL:	But now, black folks aren’t scared. MARSHALL:	They stand on the, when they parade, blacks stand on the street and laugh at them. HAMILTON:	Oh, you got out, you got out of the way, I know. HAMILTON:	That’s interesting, though. Yes. MARSHALL:	part of the change that took place [laughs]. MARSHALL:	So you saw them in youth, but during this particular period of which we speak, you saw many changes taking place here in this community. HAMILTON:	Oh yes, yes, mm-hmm. MARSHALL:	For example, what black businesses in your time of growing up here do you recall? MARSHALL:	And I’m thinking of the, any type of entre—mostly entrepreneurial, all we can go into. MARSHALL:	There was one downtown, wasn’t there? MARSHALL:	Not when you came [over]? HAMILTON:	I can’t think of the gentleman’s name. HAMILTON:	You’ve heard his name mentioned, I’m sure. HAMILTON:	on Harriet Street, and there was one on Harriet Street between, uh, Washington and South Adams, South Adams on Washington, then, there was one that, that developed, there’s always that bar, on the middle of, of, uh, Harriet 35:00Street there, between South Adams and South Hamilton. HAMILTON:	Northern Lights. When we were coming up. MARSHALL:	That’s owned by white folks, isn’t it? HAMILTON:	No, that was owned by Mrs. Mahaley. MARSHALL:	Oo, was that Mrs. Mahaley? MARSHALL:	That’s still owned by blacks? HAMILTON:	But they’re trying to transfer the license. HAMILTON:	They’re trying to sell the property. MARSHALL:	Do white folks have it or blacks have it? MARSHALL:	Blacks still have it. HAMILTON:	Oh yes, cur—the, the, the title, the license is still in her name. HAMILTON:	And her estate’s trying to sell it. They've been trying to sell it. MARSHALL:	That’s up where, uh, [Ebeth’s], where, uh, [Onetha’s] place is? HAMILTON:	No no, right now, it’s where, uh, it’s, it’s vacant now, it’s on the corner of, it was on the corner of, of Harriet and South Hamilton. It’s 36:00all vacant through there now. MARSHALL:	Oh I see, uh-huh, uh-huh. Do you remember a restaurant there where Ometha is? HAMILTON:	Oh yes, yeah, oh yeah, yeah, that was, that was a little later, we were all, I was in the, in the, mmm, yeah, the forties, late forties, mm-hmm. Hart Cartwright, uh, ran that, Reuben Cartwright. MARSHALL:	he’s just going to the hospital. MARSHALL:	Yeah. She dresses hair. HAMILTON:	No no no, that’s his, that’s his second wife. HAMILTON:	His first wife, he and his first wife opened this restaurant. HAMILTON:	He was a minister. MARSHALL:	Yeah. Still is, I think. HAMILTON:	Oh yeah, he still is. HAMILTON:	But he’s, he’s, he’s pretty senile now. HAMILTON:	pretty…y’know, uh, in—incapable of really caring for himself, poor fellow. HAMILTON:	But he seemed to live on. HAMILTON:	But, uh, he and his wife have this restaurant. And they just—Mrs. Cartwright did a good job of—back in those days, you see the war was on, war 37:00was coming down, and that area was surrounded by temporary housing. HAMILTON:	Fellows who worked in the construction, they’d come there and eat a good hot meal, at least once or twice a day, and, and it served a good purpose, because they couldn’t eat downtown. MARSHALL:	Yeah. Did you have a USO? HAMILTON:	They, this, there was one, but it was out at the airport. MARSHALL:	I mean, blacks and whites? HAMILTON:	Yes, if they wanted to, out there. MARSHALL:	Well, I was, I knew for the military. MARSHALL:	But I wondered if there was ever any reason to have a separate—you know, some cities had separate ones. HAMILTON:	But they, they, uh, because it’s housing, because of the housing on the South Side, they had a, what they call a community building. HAMILTON:	Which is where the Post is. HAMILTON:	for that area and, and eventually the Post, American Legion Post, when they closed it down, took over it as their facility. HAMILTON:	’Cause they still couldn’t get into the post on North Huron. MARSHALL:	Oh yeah, yeah. Still can’t. MARSHALL:	I guess you can. MARSHALL:	But they don’t want you. MARSHALL:	Well, you know, I, I don’t know, I suppose it’s about, one, it’s about as much a one as any other. They don’t want us, but really, we don’t want them either. MARSHALL:	At least I don’t. HAMILTON:	No. If they come, if they come into the post down here, I don’t go down there. HAMILTON:	And if you go down here, somebody’s going to ask you, uh, “You sure you’re at the right one?” I was in there, I said, “No, I, I came, came to the post! This the American Legion post?” I knew half the guys who were there. HAMILTON:	I didn’t stay very long. MARSHALL:	But I’ve never been down there. HAMILTON:	No, the, it’s, it’s, it, it, at one, at one time it was a very influential group. HAMILTON:	They, they moved them out. HAMILTON:	the older fellows. Mm-hmm. HAMILTON:	But there weren’t any businesses. There weren’t, there weren’t any, there were a lot of fellows [in that earth] people around town who did little odd jobs. HAMILTON:	But he couldn’t get the kind of business he wanted, and, and, just like Herb Francois. Herb, as you probably know now, tried to have a newspaper. MARSHALL:	And I haven’t found a copy of it. HAMILTON:	I probably, I may have some around. MARSHALL:	find a copy of that. HAMILTON:	because I used to, I, I, I’m sure I got some around. I’ve [ ] clippings from them. HAMILTON:	it was a nice little thing [to do] in the community. I should have some of those around. I’ll look and see. HAMILTON:	Not the best moment. MARSHALL:	By the way, just for the record, when did your mother die? HAMILTON:	My mother died 1941. HAMILTON:	Yeah. She died of, uh, at home. MARSHALL:	Then your father remarried. MARSHALL:	And who did he remarry? 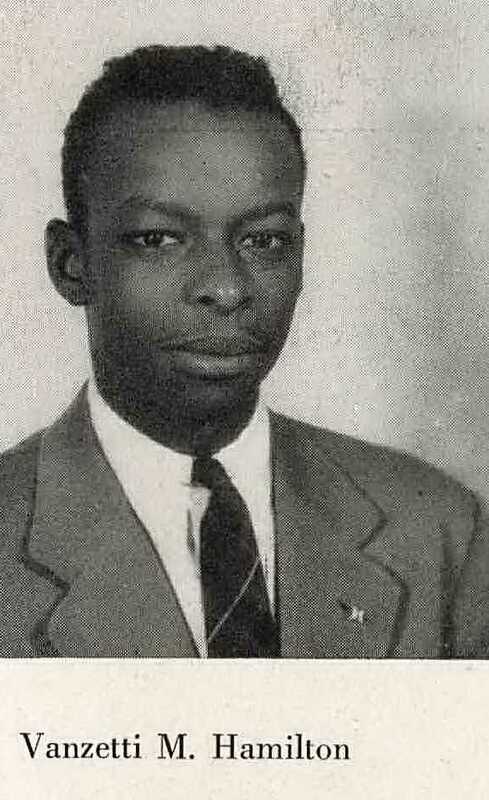 HAMILTON:	He married Reverend Garther Roberson’s sister, Mrs. Willie Wilson. MARSHALL:	The one you refer to as your stepmother. HAMILTON:	Yeah, she was a grand, she was a grand lady, she was really a, she really helped to raise us. HAMILTON:	’Cause we were all youngsters. MARSHALL:	Yeah. Mm-hmm. Now, you, you came back, and you came back here, what 41:00year, what year did you actually open up for practice? HAMILTON:	Well I, I finished law school in ’57. And I had uh, then, uh, I wanted to open a law office, but, I just couldn’t seem to find, believe it or not, I just couldn’t seem to find a place. And, uh, in fact, back in those days, can you believe it, in 1957, I um, I began to be active in the Democratic Party. HAMILTON:	And, uh, because I couldn’t do it when I was in law school. I just, I just had to keep my nose to the grindstone, ’cause I was a little, I just felt I would, they would kick me out if I flunked anything. HAMILTON:	But anyhow, so I got back and I got active in the Democratic Party, and getting active in the Democratic Party, one of the, one of the, um, one of the fellows who was in the area, whose name I won’t name, said, uh, “Well, look, Van, we got this house over here on Emmet Street, that, uh, no blacks was there, why don’t we, why don’t we break the ice,” y’know, I said, 42:00“Well, that’s all right with me,” it was just an old house. So we bought it, for a song. A couple of fellows who were at, one is dead and one now is a judge, were going to file a lawsuit to keep me from buying that house. One is now a judge. MARSHALL:	And I’ll bet you when you see him, you disagree with it. HAMILTON:	Oh, he just, arms open. So anyhow, uh, so we bought it. And well, he, they didn’t care, all they wanted to do was keep it occupied and have some money coming in, because there was a, it was in an estate, which didn’t have any money. HAMILTON:	But I was building up enough contact with people at home that I thought I, I didn’t really want them coming to the house. We had two youngsters then, so, believe it or not, we got the place, Marsh Office Supply sold me my furniture, all the furniture, on a time basis, with a loan to Ypsi Savings Bank, and we started work. And I was just amazed. But things were breaking then, for blacks. MARSHALL:	That was you and these other lawyers. MARSHALL:	You and these other lawyer, or was that you by yourself? HAMILTON:	I opened it all alone. MARSHALL:	You started by yourself. HAMILTON:	Alone, yes, all alone. MARSHALL:	Yeah, yeah, yeah, yeah. HAMILTON:	Judge Breakey, He was just, he was just, he, he was a, he was all right, he was, he was right, but he was too right. MARSHALL:	When you say Garther, you’re talking about the old Garther. HAMILTON:	The old Garther Roberson. He was—and when I was coming up, that was the only church. HAMILTON:	little Churches of God. HAMILTON:	So that was the church. HAMILTON:	And, and, Methodist church and that church, well, the churches, and Judge Breakey kept in touch with those ministers. And they kept in touch with him, because our people were always before Judge Breakey. HAMILTON:	Reverend Garther Roberson would just smile, [laughs] he was a grand old fellow. He didn’t have much education but he was a great leader. HAMILTON:	He could lead people, and that’s a, that was important. HAMILTON:	and he encouraged me to go into practicing law, so really, when I was in my office, Booker had opened his, and he had a hard time too. HAMILTON:	Booker Williams had a hard time getting a place. MARSHALL:	Did he come out of the same law school you did? HAMILTON:	No, he went to Michigan. MARSHALL:	Oh, I see, mm-hmm, mm-hmm. HAMILTON:	But Booker was, uh, he opened up here, so he, he had a lot of contact with uh, the old Simons family. He married the Simons daughter. So they had, he 46:00had a lot of contact with him. And that helped him to get a, a, a base, among, among the powers that be. HAMILTON:	And, uh, so here we were, and I always thought too that [laughs] the Democrats thought that here was Booker who was catering to the Republicans, who was a lawyer, we’d better get a black Democratic lawyer in here. So they, I was catering to the Democrats, so that gave us both, we really had a good base, we really did. We had, and we, we, I don’t want to put that down, anyhow, it was interesting. HAMILTON:	and, and uh. So it uh, and Judge Breakey was very helpful. HAMILTON:	And Dr. Perry’s, frankly, Dr. Perry’s, uh, practice was, was 75 per cent white. MARSHALL:	Yeah, yeah, mm-hmm, yeah. HAMILTON:	Blacks just didn’t go to the dentist that frequently. MARSHALL:	Had to go to the back door. MARSHALL:	They’d go to somebody else’s back door. MARSHALL:	I remember that much. HAMILTON:	Sure, but the, but the, Dr. Perry, he just couldn’t handle them all anyhow. HAMILTON:	he was building houses, and, and, it helped to get, be able to have some contact with these banks. MARSHALL:	[Was ever] Reeves a pastor of a church? HAMILTON:	Yes, mm-hmm. He had his, he pastored that little church where, that is now next to your, next to Brown Chapel. HAMILTON:	organized his own church with his own family, there. MARSHALL:	Yeah. Oh, I see. HAMILTON:	starting up there. He had enough, we always say, he had enough in his family to have his own congregation. HAMILTON:	And his kids would say, “Yeah, you Hamiltons do, too,” so we laughed at each other. HAMILTON:	We always had a good joke about that. HAMILTON:	He had all girls, too. MARSHALL:	Yeah, one of them worked for me up on campus. MARSHALL:	in Ypsilanti, and one of the things that I know about, and this was 49:00partially at least at the instigation of the NAACP, was the Human Rights Commission. HAMILTON:	Oh yes, mm-hmm. Yeah, first they just had a uh, um, I, I’ve got information on it, back in my files. HAMILTON:	But it wasn’t Human Rela—it was more of a, an advisory committee first. HAMILTON:	And, and, um, in the NA—we were all active in the NAACP then, everybody was really active in the NAACP back in those years. HAMILTON:	but you could, uh, you could join the, I guess you could join the, uh, oh, well, you couldn’t join much of anything else. HAMILTON:	Dr. Bass. I have to think. MARSHALL:	But you must have had some white members. MARSHALL:	Was Ericson in that group? HAMILTON:	Yes, that’s right, Ericson from the Eastern Michigan, that’s right, mm-hmm, Ericson, and, uh, bless her heart, the lady who lived down here on Pearl. What taught at, uh, Lincoln. HAMILTON:	Uh, but the whites were on the, on there, the majority of them were really interested in trying to resolve any differences. There were a couple of them who were just there as a thorn in your side, so to speak, and we almost came to blows one night, about it, publicly. MARSHALL:	Was Bass the first chairman? HAMILTON:	twenty-five to thirty years ago, you know? MARSHALL:	Yeah, I know it. Do you remember distinctly any of the, and this is going back, I know it, is, this is, this is stretching your memory, do you remember any specific accomplishments over there? I know it was persuasive and 51:00all of that, but, what did they really accomplish? HAMILTON:	because the blacks, blacks and whites were gonna have to get along, that’s all. We were going to be here, and we just weren’t going anywhere, so they just might as well, they might better settle down and try to get along. HAMILTON:	And that’s what the commission, I think that started that attitude. And some, and there were, there were some dedicated people on there. HAMILTON:	Like, well, well, Ericson, and um, another gentleman from the psychology department at Eastern, he’s in Ann Arbor, oh, oh I can’t think of 52:00his name. But I’ll think of it eventually. HAMILTON:	He’s in Ann Arbor now, he’s very active with the B’nai Brith. HAMILTON:	But, uh, I can’t think of it, but, uh, there were some really dedicated people, and they were al—well, they were almost all alone at first. HAMILTON:	The Huron Hotel, but they didn’t particularly care to have blacks coming there, but we took care of that eventually. MARSHALL:	Okay, when, when you say ‘we,’ was that the NAACP? HAMILTON:	Along with the Ypsilanti Business and Professional League. MARSHALL:	Business and Professional League, okay. MARSHALL:	Business and Professional League. HAMILTON:	Business and Professional League, mm-hmm. MARSHALL:	And then, uh, well, of course, then you had restaurants, you had some problems with restaurants. MARSHALL:	Didn’t care about you coming in. HAMILTON:	They didn’t want to go anyhow. MARSHALL:	Well, I don’t know why, I, I question why you say they didn’t, really didn’t want to go. MARSHALL:	E—e—either they couldn’t afford to go, or they felt they weren’t welcome. MARSHALL:	Well, do you feel it was more that? HAMILTON:	More not being welcome. MARSHALL:	But there were some of us who couldn't afford it. HAMILTON:	That’s true, oh yes, yeah, mm-hmm. MARSHALL:	Okay. So we didn’t go even if, even if on occasion we had the money we sort of shied away from them because we knew we wouldn’t be welcome. MARSHALL:	we’re talking about the same country. HAMILTON:	but we younger blacks, the younger blacks decided we were going to go anyway. MARSHALL:	Going to go in there, right. MARSHALL:	That’s the issue, yeah. HAMILTON:	The fellows in town used to always go across the street and eat lunch at the Huron Motor Inn. HAMILTON:	Ho—Huron Hotel, at noon. HAMILTON:	Se we visi—I, I went, too. HAMILTON:	I, I eat lunch down here, too. HAMILTON:	But I thought it was just good to, to commingle with the fellows. MARSHALL:	Well, what you eventually did, of course, you got the white folks used to us. MARSHALL:	Well, we went through the same thing. MARSHALL:	[laughs] I remember my wife, my wife was working downtown, and there was a restaurant where they said, they didn’t, they didn’t even, didn't even know if they served black folks, and she’d been eating in there for months and months. MARSHALL:	And finally when they discovered that she was eating in there, then they changed it, they put it on the list of those that would serve them. MARSHALL:	But I also know by 1961, when I was president of the Michigan, Missouri Library Association, I called a meeting of, uh, of, of, my [ ] community and I had them come to Jefferson City, and we went to a hotel that had just recently opened up. MARSHALL:	And, they take us in the rooms, and they would take us in the major dining room, but they had another dining room, and they wouldn't serve us there. MARSHALL:	I mean, this was the kind of, it was in ’60, ’61. HAMILTON:	But one at a time. MARSHALL:	Oh, you’re talking about uh, the guy in Detroit. MARSHALL:	Yeah. I know who you’re talking about. HAMILTON:	I’ll think of it. HAMILTON:	I’m sure you’ve heard his name in your discussions. MARSHALL:	I knew about him when, I knew about him before he died. MARSHALL:	Yeah, I know who you’re talking about. HAMILTON:	back than, way, that’s a long time ago. HAMILTON:	He was all alone there, we don’t know how they kept him on. HAMILTON:	Brockman, mm-hmm. He used to live near, near Beatty on Harriet—on Hawkins street, there. MARSHALL:	ever mentioned his name? HAMILTON:	Mm-hmm. He was on there one term. MARSHALL:	Yeah. Let me write that down, here. Uh, no, nobody mentioned that name to me. T-E-E Brockton. MARSHALL:	Do you ever remember anything about a, a man being on the City Council who was never informed that he was elected? MARSHALL:	This was even back before the other guy. HAMILTON:	Before uh, the other fellow out in [Canton] right now? MARSHALL:	Yeah, yeah, right, right. And, somebody told me about that, and said this guy was on the City Council and then they never informed him, or something, until his term was up. He didn’t find out about it till his term was up. He didn’t find out that he had been elected to City Council. MARSHALL:	No, I think that would have been before your time. MARSHALL:	You would have been young, but seems to me that was in the latter 57:00’30s. Talking about ’30, ’39, something like that. HAMILTON:	for the City Council back in those days. MARSHALL:	Was Herman, was Herman ever in the Business and Professional League? MARSHALL:	But Ben Neely was. Ben Neely. Was Ben Neely still active when you came along? MARSHALL:	I understand Ben Neely was a charter member. HAMILTON:	I don’t know if he was, now, I don’t now. HAMILTON:	He could have been, he could have been. HAMILTON:	But I know, when I came along, he wasn’t active anymore. MARSHALL:	Yeah. But of course, he’s pretty old. By the time you came along, he was a pretty old man. MARSHALL:	Had to be, ’cause he, he pretty old now. HAMILTON:	Well, he’s been, can’t be more than 70 now. HAMILTON:	Maybe 70? So he’s probably, he’s probably close to 75. HAMILTON:	Oh, no no no no, he’s about, at the oldest he’s probably maybe 75. HAMILTON:	He had married her niece. MARSHALL:	But they said the old man was really, was really something. MARSHALL:	back in those days. HAMILTON:	but his, oh, his dad was, his brother was something. HAMILTON:	He was a, he was a long-time Republican, but he spoke up. MARSHALL:	I got a date with Ben Neely. HAMILTON:	You should, because he isn’t well, you know. MARSHALL:	Yeah, that’s what I hear. MARSHALL:	Yeah, yeah, that’s what I hear. HAMILTON:	I, I saw him in the hospital, oh, a month or two ago. MARSHALL:	Well everybody referred me to him. HAMILTON:	If he can just remember. His health is failing, though. MARSHALL:	want to mention one other thing that I picked up and I’d like for your comment on it. I picked up that Martha Neely, you know Martha? Martha is Old Lady Clara’s sister. MARSHALL:	She is Foley’s mother. MARSHALL:	Martha Neely graduated from Eastern Michigan University in 1960. HAMILTON:	Now that, I, I can’t, I cannot verify. MARSHALL:	just wondered if you’d ever heard it. HAMILTON:	Never heard it, no. Partial Transcript: MARSHALL: Major concern is establishing your name. HAMILTON: My name is, my name is Vanzetti, Vanzetti M. Hamilton. Segment Synopsis: Vanzetti Hamilton answers questions about his family and gives the names and birthdays of his siblings. He also talks about the families early history and move from Detroit to Ypsilanti. Hyperlink: Photo of Vanzetti Hamilton editing the Aurora, school newspaper. Partial Transcript: MARSHALL: Okay, now, you came here and, and, ’36, and, ’course, um, do you remember anything specific about the area when you came? MARSHALL: so far as, um, it being black in Ypsilanti was concerned? HAMILTON: Yes…we can only live, or by, south of Michigan Avenue. Segment Synopsis: A.P. Marshall and Mr. Hamilton discuss going to school in Ypsilanti and the leading role his older brother, Theo, played in his school career. Subjects: African American families. African Americans--Education--History--20th century. Hyperlink: Vanzetti Hamilton's 1947 High School senior photo. Partial Transcript: MARSHALL: Uh, then, um, how’d you get to, well, you, you, well, let, let me [and for] go ahead and establish some basics, again. You graduated from Eastern what year? Segment Synopsis: Vanzetti Hamilton describes his choice to become a lawyer and some of the difficulties in getting admitted to law school from Black students at the time. Subjects: African Americans--Education--History--20th century. Labor unions. African American law students. Partial Transcript: MARSHALL: Okay, uh, somewhere along here you met your wife. HAMILTON: Yes, I, I had met her when I was going to Eastern. HAMILTON: She was going to Cleary. And so, uh, she, uh, we were dating, uh, frequently, and so she uh, the year I graduated, from Eastern, she had a choice of either staying here and working, either in the Ypsi Housing office, or the Willow Run housing office, or in Eastern housing office, they, as you can imagine in those days, they, they just didn’t hire the black girls were all, they were good, but they just wouldn’t hire them in other places. The federal government was a primary employer. Segment Synopsis: Vanzetti discusses meeting his wife, Arbra Jean Fullerton of Battle Creek, a student at Cleary Business school, and having children. Subjects: Marriage. African American families. African Americans--Education--History--20th century. Partial Transcript: MARSHALL: So you saw them in youth, but during this particular period of which we speak, you saw many changes taking place here in this community. HAMILTON: Oh yes, yes, mm-hmm. MARSHALL: For example, what black businesses in your time of growing up here do you recall? Segment Synopsis: Mr. Hamilton is asked about his memories of Black businesses, business owners and other professionals in the Ypsilanti community as he was growing up. Mr. Hamilton and Mr. Marshall have a conversation about Black and white American Legion Halls. Subjects: African American business enterprises. 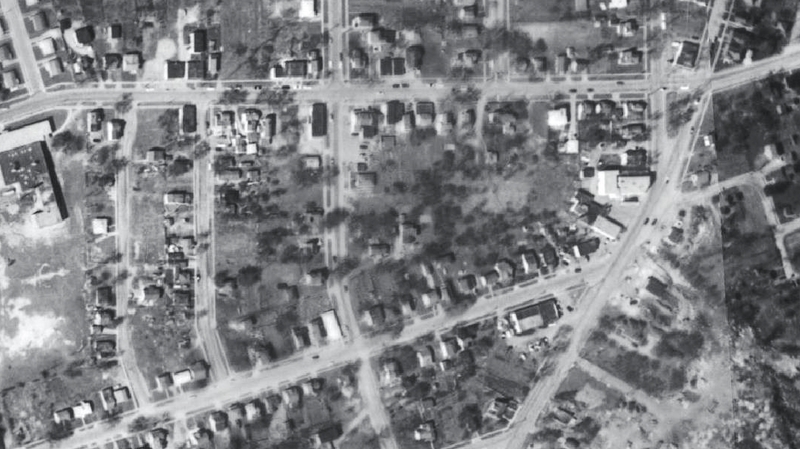 Hyperlink: Aerial view of the former Harriet St. Black business district, circa 1940. Partial Transcript: MARSHALL: Yeah. Mm-hmm. Now, you, you came back, and you came back here, what year, what year did you actually open up for practice? HAMILTON: Well I, I finished law school in ’57. And I had uh, then, uh, I wanted to open a law office, but, I just couldn’t seem to find, believe it or not, I just couldn’t seem to find a place. And, uh, in fact, back in those days, can you believe it, in 1957, I um, I began to be active in the Democratic Party. Segment Synopsis: Vanzetti Hamilton describes what it took for him to open his legal practice in Ypsilanti and his developing political role in the Democratic Party. Subjects: African American lawyers. Political participation. Democratic Party (U.S.). Hyperlink: A September 13, 1963 news story on a Civil Rights movement case in which Mr. Vanzetti was counsel. MARSHALL: in Ypsilanti, and one of the things that I know about, and this was partially at least at the instigation of the NAACP, was the Human Rights Commission. Segment Synopsis: Mr. Hamilton and AP Marshall discuss the Civil Rights-era in Ypsilanti and the reforming of the area's NAACP. Subjects: Civil rights movements--United States--History--20th century. NAACP (Organization). Segregation. Race discrimination. 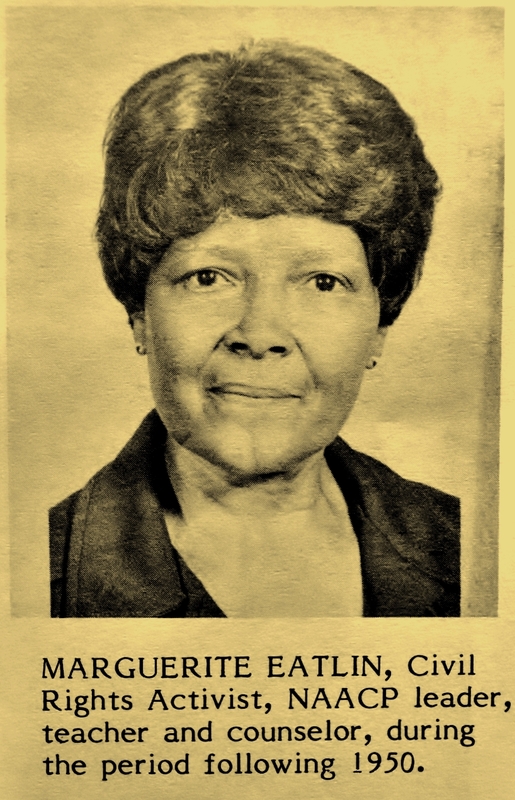 Hyperlink: Photo of Ypsilanti NAACP leader Marguerite Eaglin.